The Leek provides pocket-perfect size and high-performance materials. It offers a distinctive design as well as SpeedSafe ambidextrous manually assisted opening. With SpeedSafe, the user can smoothly and easily deploy the blade with just one hand, either left or right. It comes with a secure locking liner and a removable/reversible pocket clip for tip-up or tip-down carry. The newest Leek, the dramatic composite-blade Leek, combines the durability and corrosion resistance of 14C28N stainless steel with the toughness and wear resistance of CPM-D2. The two steels are permanently fused together and the join is highlighted with an attractive copper accent. Designed to go anywhere and do just about anything, the made-in-the-USA Leek is the ideal carrying knife. The Leek series includes some of Kershaw’s most popular knives, and this model is no exception. 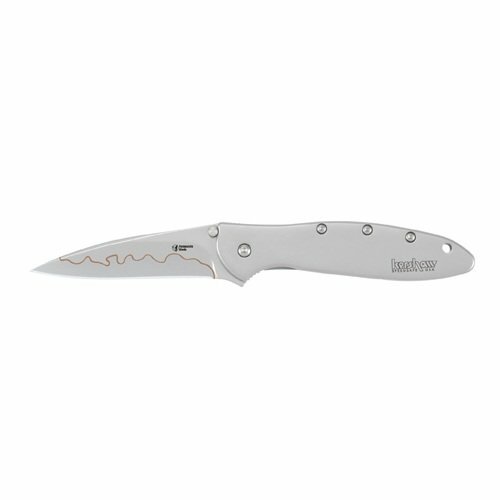 This particular knife features a distinctive design by celebrated knife maker Ken Onion, who created the SpeedSafe ambidextrous assisted opening system. With SpeedSafe, the user can smoothly and easily deploy the blade with one hand, either left or right. 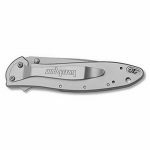 This makes it ideal for sporting and work situations in which one-handed opening is easier and safer, such as when hunting, fishing, or working with your hands on the jobsite. The Leek also sports a simple bead-blasted stainless-steel handle, which offers strength and beauty. If the stainless handle isn’t your cup of tea, Kershaw also offers the Leek in a variety of other handle styles, some with technologically advanced coatings for enhanced performance. For example, the “smoked” double-anodized aluminum handle gives the Leek a truly one-of-a-kind look, while the black tungsten DLC-coated handle produces a non-reflective surface. 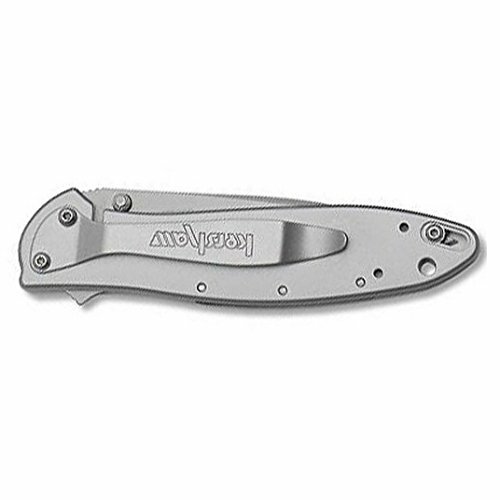 The Leek also comes with a Kershaw pocket clip, which is meant to be clipped with the handle on the inside of your pocket. The clip is not to be worn on a belt, as this is an unsafe way to carry your knife. 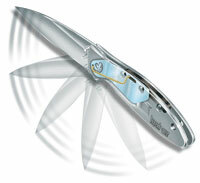 The SpeedSafe assisted opening system lets you smoothly deploy the blade with 1 hand. The patented SpeedSafe knife-opening system helps users open the knife by applying manual pressure to the thumb stud or blade protrusion. The heart of the SpeedSafe system–which is built into many of Kershaw’s best-selling knives–is its torsion bar, which keeps gravity from opening the knife. After the blade is out of the handle, the torsion bar moves along its half-moon track and takes over, smoothly opening the blade and locking it into position, ready for use. Although they may look similar at first glance, SpeedSafe knives are not considered switchblades. Unlike a switchblade, SpeedSafe knives do not deploy with the push of a button in the handle or by gravity alone. Instead, the user must manually overcome the torsion bar’s resistance, putting the knives outside the federal definition of a switchblade. However, it’s the responsibility of the buyer to investigate and comply with the laws and regulations that apply in his or her specific area. Buyers should rest assured, however, that SpeedSafe knives are extremely safe, as they open only when the user manually deploys them, and lock securely into position when open so they don’t close accidentally. A master of his trade, Ken Onion is one of the most sought-after custom knife makers in the industry. His custom knives can be found in the most prestigious private knife collections as well in as in the pockets of his dedicated customers. Ken’s involvement in the knife trade dates back to his time in Palestine, West Virginia, where he was inspired at the age of 12 by Vernon Ott, a local blacksmith and maker of garden tools and knives. In the ensuing years, Ken joined the U.S. Marine Corps and worked in such fields as construction, heavy equipment repair, and hydraulics repair, always with an eye toward eventually designing the perfect knife. In November of 1991, Ken met Stan Fujisaki, a talented knife maker who agreed to teach him the tricks of the trade. After years of preparation–and some inspiration while working on a Harley cam for a friend–Ken created his first SpeedSafe knife. Today, Ken designs a custom selection of knives for Kershaw, many featuring the patented SpeedSafe torsion bar system for assisted opening. Ken is personally involved throughout the design and manufacturing process to ensure that each knife meets his high standards for performance and quality.